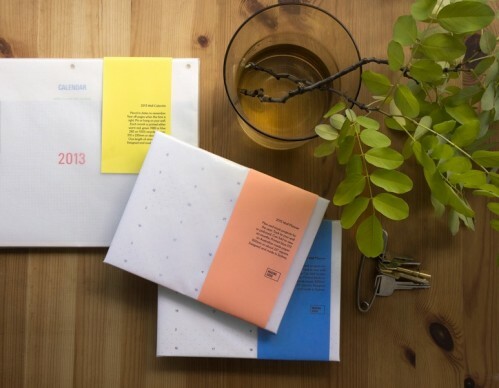 Just in time for the new year comes Making Good, a collection of perfectly minimal calendars and organisers. We spoke to those behind Making Good, Mary and Samuel, about design philosophy, paper stock and the beauty in banality. Who and what is Making Good, and what do you do? Making Good is friends Mary Libro and Samuel Szwarcbord. Making Good began just this year but we are long-time collaborators and co-conspirators. We design and make printed and paper products, mostly for the home or studio. Our first two products are the 2013 Wall Calendar and Planner which you have in store. We have also just taken delivery of our Suitcase Tags which is very exciting, and there are lots more products in the works. Our focus is really on the objects that you use all the time and maybe overlook. Just because they are utilitarian and commonplace doesn’t mean they can’t also be beautiful. Where are your calendars designed and made? We work from a studio in Sydney. Our calendars are made here as well. This is something we hope to be able to continue to do into the future. People do great work here, we want to try to support that where we can. The Australian sensibility is respected around the world, we can be international and individual at the same time. Let’s get technical, because there is such beautiful attention to detail in these calendars. Can you tell us a bit about the paper that they are printed on? The Wall Calendar is printed on a 100% recycled, uncoated paper. This paper is manufactured in Austria without elemental chlorine (EC) in the bleaching process. It is a beautiful stock enhanced by its variations in colour. 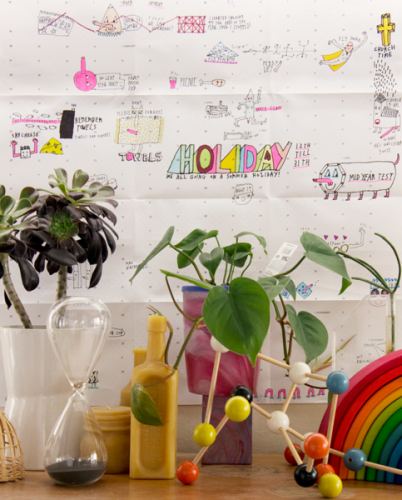 The Wall Planner is printed on an Australian made paper with a bit more texture and a nice brightness. It is also EC free. Our packaging is made from glassine paper which is beautiful translucent stock used for archival purposes, it is air and water resistant. Stamp enthusiasts, insect collectors and book binders use it for their projects – very nerdy! In three words, how would you describe your design aesthetic? What is the philosophy behind your approach to design? How well can it be used? Can it be simpler? There is beauty in banality. Sometimes ugly is ok, just the right kind of ugly. Is something standard because it is the best way to do it, or because we get lazy about finding alternatives? 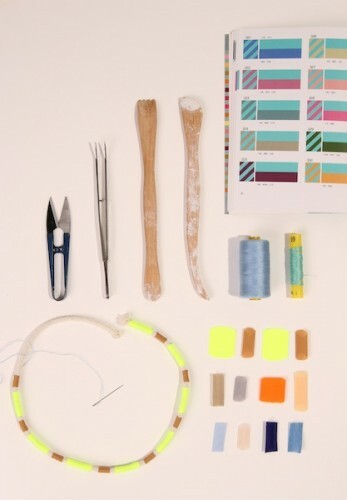 Can we use basic materials and make them a treasured possession? Will decoration help? Are we making something to be relegated to the bottom drawer or something truly useful? We hope our objects will make tasks easier, spaces more restful and life just a little less complicated. Welcome back iconic Australian fashion label Desert Designs with the release of their leading collection You Like Desert Country. 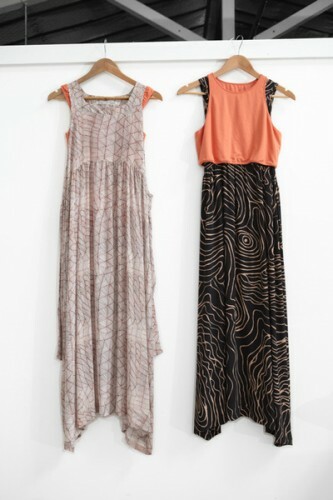 Desert Designs represents a unique collaboration between indigenous and non-indigenous artistic Australians. 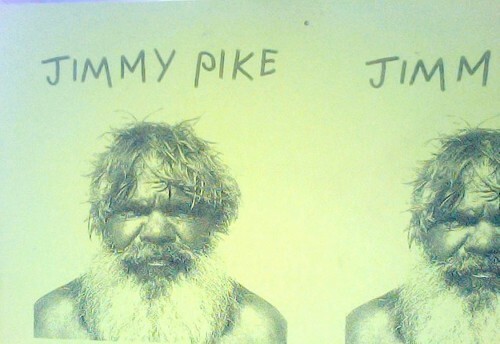 Jimmy Pike is one of Australia’s most celebrated Aboriginal artists. Pike’s artistic practice focuses on the intricacies of the desert landscape and the particularities of its Aboriginal spirituality. In the contemporary revival of Desert Designs, creative directors Jedda Daisy and Caroline strive to bring this otherwise obscure ancient philosophy into a tangible experience, a rare encounter with its beauty and sacredness. Desert Designs was initially established to promote Aboriginal art worldwide and this ambition is still at the forefront of the label’s intention today. 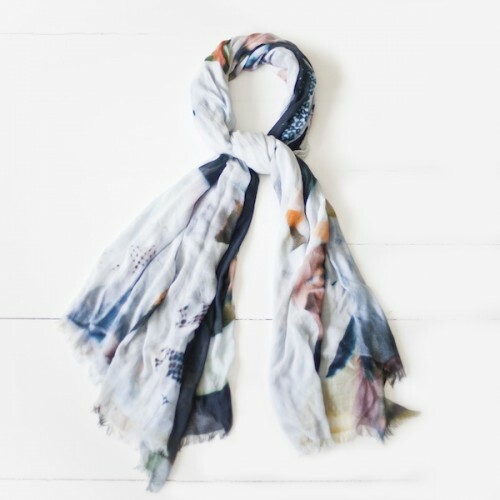 Desert Designs contribute 10% of all sales to the Jimmy Pike trust for scholarships awarded to Aboriginal artists from the Kimberly region with the aim of better developing their skills. We spoke to Jedda Daisy along with her partner Caroline about the reincarnation of the label and their Project at Poepke. Desert Designs has quite an incredible history. Can you tell us a little bit about the relationship between Jimmy Pike and Steve Culley that generated this label? Jimmy and Steve were great friends, they were both artists and shared that kind of kindred spirit. Steve recognised the genius of what Jimmy was saying as an artist and that it was something completely new, a new way of describing the environment that Steve had already started to explore pictorially. They came from totally different worlds. Steve hand spent years painting in the outback and was captivated by Jimmy’s stories of life as a nomad in the desert. Both had been in Fitzroy Crossing, a town in the eastern Kimberleys in the early 70s: a town of riots, a meeting place and at times a collision of cultures and attitudes. Fremantle prison threw them together as allies in an extremely hostile environment. Jimmy revealed an artistic sensibility and a way if seeing and being in Australia that was to change Steve’s life forever. The original concept grew out of a coming together of one of the oldest cultures in the world and Steve as a kind of artistic innovator. The launch of Desert Designs wasn’t really planned or structured, the wave of cultural and commercial success just happened. In what ways is the reincarnation of Desert Designs something new, and how does it stay true to the original concept? I think that Aboriginal people see art and life as one. You manifest your ideas and your culture and you use it, you decorate your tools and your body, it’s applied. In this sense, the age-old concept is fundamental in building a brand of commodities. The digital age would have to signify the most obvious difference between the original and contemporary Desert Designs. Digital printing has been fantastic for reproducing Jimmy’s work. It has allowed Desert Designs to work with Jimmy’s texta pen drawings, designs that could never have been reproduced correctly before. The Desert Designs prints are very deeply based in Aboriginal spirituality. How is Desert Designs about more than just aesthetics? This is so true. Desert Designs is about learning from the past, celebrating Jimmy Pike the artist and exploring our indigenous peoples’ way of seeing and living in Australia. Jimmy’s stories have reverence in contemporary society for their ancient wisdom. Today worry for our natural world dominates popular consciousness. In Australia, one source of inspiration to adapt our ways of living might be the cosmology of our indigenous peoples. I believe the philosophy behind indigenous story telling is what can save our human relationship with nature. Jimmy’s designs focus on the intricacies of the desert landscape, and the particularities of its Aboriginal spirituality transforms this extremely isolated area of remote Western Australia (and its otherwise obscure ancient philosophy) into a tangible experience. Desert Designs was out there in popularising a cultural coming together of indigenous and non-indigenous Australians. At the time, it was perhaps the most important brand that Australia had produced. It enabled Jimmy to become one of the first financially successful indigenous artists. It opened up Australian indigenous artists to new economical opportunities and provided Australians of every ethnic background with the opportunity to embrace and wear indigenous design. What prints can we expect to see as part of the Project at Poepke? Most of Jimmy’s designs have a story, some don’t. ‘Moonlight Sandhills’ and ‘Jilji and Jumu’ are patterns that are a both a map, and a meditation of the wind and ever present change that occurs in the desert. ‘Rainbow Mountain’ or ‘Mirtiny’ is a rocky outcrop that exists on the fringe of Jimmy’s country, and seem to shimmer in light and colour like a mirage in the distance. ‘Mangkaja’ is the owl. He travelled in the desert and landed in one place. He flew round and round and made a deep hole in the ground. Water came up and people still go there for water. Unique to Projects at Poepke, Desert Designs has introduced a new artistic collaboration. We’re working with Maningrida Arts & Culture (MAC) to promote the indigenous artists of the Maningrida region. The art of Maningrida is heterogeneous, dynamic and innovative, reflecting the diversity of languages and cultures present in Maningrida Arnhem Land. 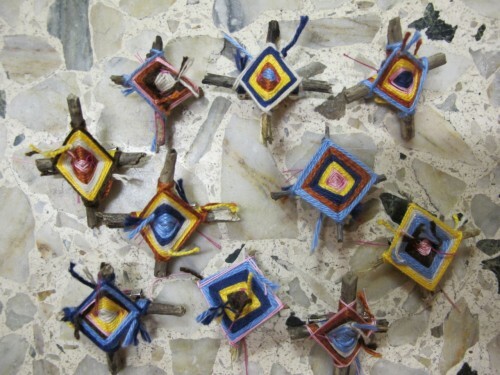 As part of our Project, Desert Designs will be exhibiting fiber sculptures by artists’ from this region. A slice of all sales goes to the Jimmy Pike trust. What is the purpose of the trust and what kinds of projects is it involved in? The Jimmy Pike Trust was established by his wife Pat Lowe. The Trust awards the Jimmy Pike Scholarship to a chosen Aboriginal artist twice yearly from the Kimberly region with the aim of better developing their artistic gifts. Printmaker Roseleen Park currently holds the scholarship. 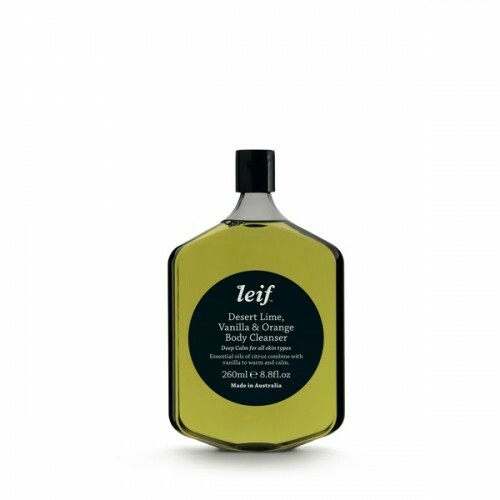 Leif is a highly evolved range of skincare products. Drawing literally and conceptually on our unique Australian native environment, the range is cleanly formulated and bio-active, and centres around daily basics. We interviewed Jonnie Vigar, one of Leif’s creators, about the range that will be our next Project at Poepke. Leif has grown out of your Sydney-based design studio, Container. Could you tell us a little bit about who you are? What has Container’s previous experience with beauty products been? Over the past decade as Container, we’ve designed custom packaging for local beauty brands. The studio was formed when Brenan (product design) and I (graphic design) worked together on a haircare range that local session stylist Kevin Murphy was developing. A few years ago, we opened a production office in Shanghai so now we manufacture everything that we design. For some clients we provide custom packaging but for others, like KM, Korner Skincare and Original & Mineral, we deliver both the package and the brand identity. Our work to date has been more haircare than skin because the types of packaging that skincare demands (such as jars) tend to demand a higher investment in terms of tooling, which can get expensive. 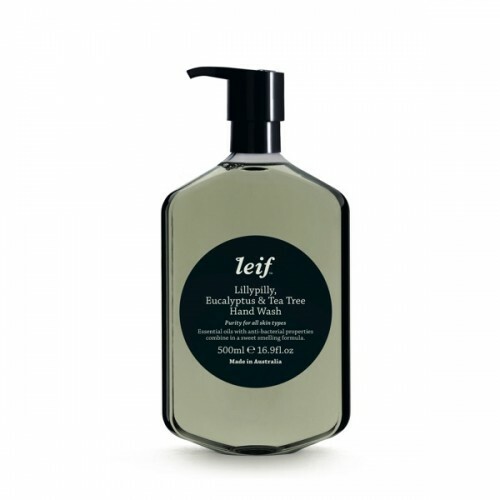 The Leif range began a little unusually – with a bottle before its contents. What was the process that has resulted in these products. Generally we design the package once the formulation has been confirmed but often both the product and the package are developed at the same time. Leif initially began as a simple design study of a single package for no client in particular. For many years, a model of the fine necked bottle sat on a shelf in our studio and visitors always seemed to be drawn to it. The task for any cosmetic package is that it attracts someone’s eye, hopefully leading them to testing the product within, so the interest that the bottle generated gave us confidence to develop a family of packages based on the original and think about what sort of formula might fill them. Very early on, Wallpaper* magazine singled out one of your products as the ‘Best New Grooming Product’ in their annual Design Awards. What was that like? It was amazing but a little too early! Late in 2010, soon after finalising the formulations, we sent a couple of pre-production samples over to Wallpaper. 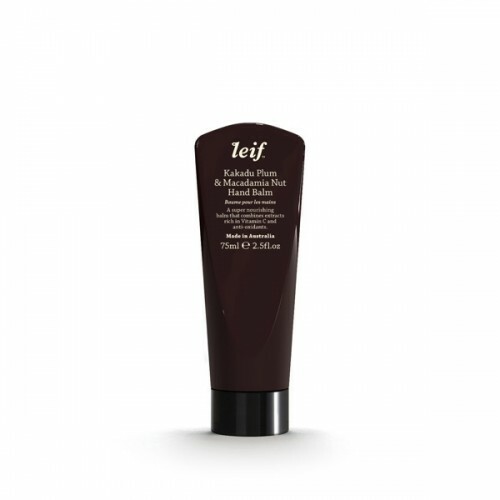 The beauty department decided to enter them into their Design Awards for 2011 and by January Leif had been shortlisted. 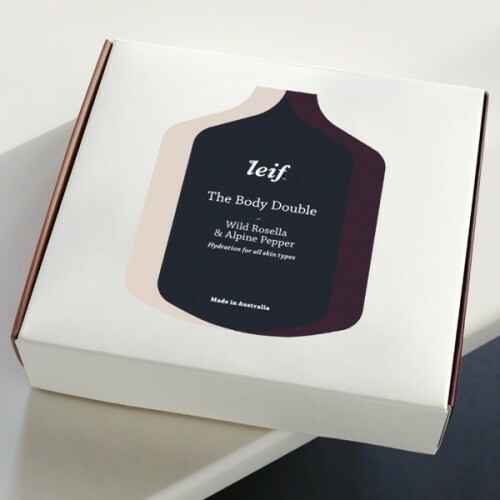 At that stage, we hadn’t yet run production of the packaging and Lief finally went on sale a week before Christmas, so we just managed to launch in the same year as receiving the award. Leif is distinctly Australian, particularly in its ingredients. What kinds of extracts and essential oils can we expect to find in the range? For us, the formulations were the final part of the package but we knew they had to deliver. The brief was that they be naturally derived, ‘clean’ (avoiding ingredients that have specific health concerns) and that Australian natives be central to all. We imagined that Leif would be of particular interest overseas, as our native ingredients seem exotic, but it has also been really well received locally. In cosmetics, we often look elsewhere for innovation but for naturals, Australia has some of the most potent plants on the planet – particularly in terms of anti-oxidant properties. Kakadu plum, lillypilly and desert lime all feature within the range, as does Eucalyptus (in the hand wash for its anti-bacterial qualities). Rather than being an overpowering smell, the blend of essential oils delivers something more subtle. It’s been a steep learning curve and committing to natural formulations throws up its own challenges. Global brands use synthetics so that production runs are consistent (and cheap) but, by their nature, natural, raw ingredients vary due to the season and the supplier. Knowing that the fragrance of each Leif product comes only from the natural extracts and oils that they contain is the payback. Sydney label Rittenhouse is a firm favourite here at Poepke. We live in their mohair knits and cool anoraks, and can’t believe how soft their leather shoes are. (Have you tried the suede ballet flats? Butter soft!) So we stole some time to pose a few hard-hitting questions to the designers, Sally and Micah. Brown rice with umeboshi plum, seaweed and roasted sesame seeds, this is kind of a newish breakfast obsession, I was going to just say I had weetbix but Juliet has threatened to change it anyway. 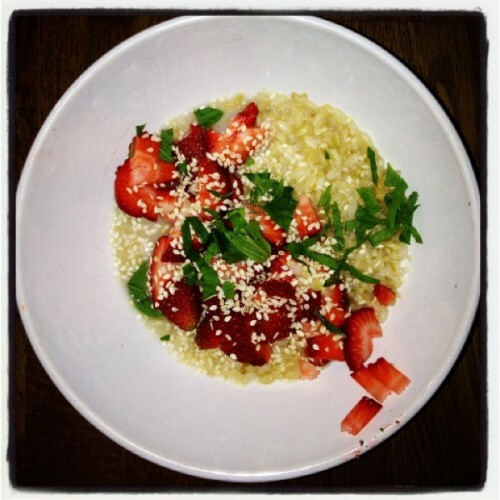 So, yes, it’s all about brown rice for brekky, it is particularly good with berries and mint! What was the last film you loved? ‘The Descendants’ was the last movie I saw and it was pretty great, we went all the way OTB to see it and were not disappointed. In terms of really really loving a film though, Adaptation and Stranger than fiction are 2 films that we both love and need to watch at least once a year. Socks and sandals: yes or no? Who would compose the soundtrack of your life and why? Cinematic Orchestra and Dr Octagon, I think, hmm, yes, well why not it could be a fantastic combo? 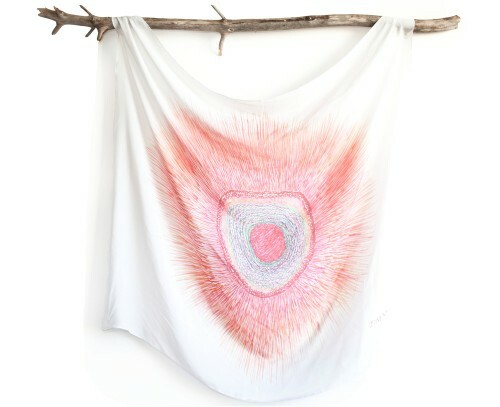 Candle of Vision is a collection of wearable objects created by Kevina-Jo Smith, an artist based in the Blue Mountains. 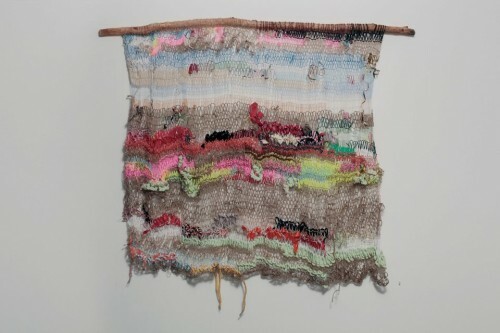 Driven by her environmental consciousness to respond practically and symbolically to waste, Smith creates complex reworkings of found materials, resulting in evocative, abstract pieces. Each object from the Candle of Vision collection is one of a kind. 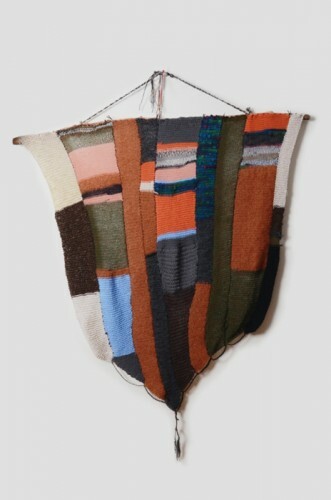 Each operates both as an artwork and as a functional, wearable piece: either a cape, vest or necklace. 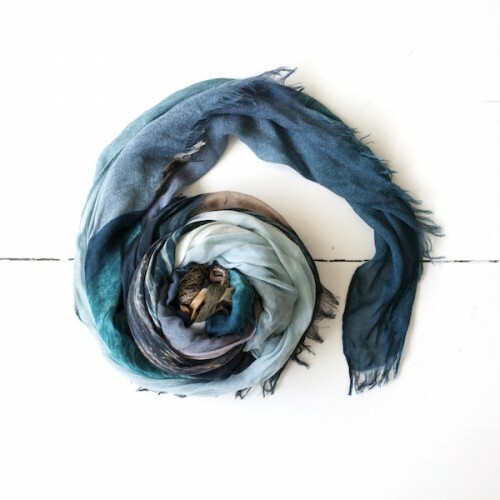 Working with natural soft wools, leathers and wooden beads, each piece is intricately hand-crafted by Smith ‘on the mountain’. Kevina, can you tell us a bit about yourself and your art? I like to make things which are useful and/or thought provoking. I guess this is why I began Candle of Vision. I can continue to develop my art practice conceptually and still satisfy my need to make useful, wearable objects. You are a very environmentally conscious person. How does this filter into your practice? It pains me to throw things out that will only end up as landfill, so I keep everything. I start to see a pile of ‘waste’ as a pile of materials. I think people who make things in general – builders, artists, designers and so on – have a responsibility to be aware and to create awareness in what they produce. What kinds of pieces make up your collection for Candle of Vision? 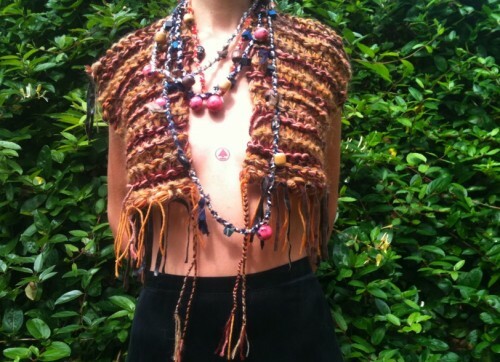 Large blankets or capes, shawls, vests and necklaces. They are meant to transcend time and stay with you for life. I like the idea of someone falling in love with a piece, to treasure it and add it to other items which they love and treasure. I feel an obligation to bring back the kind of mentality when things were cared for and passed on. That is why I only make one of everything. The pieces are unique, to be found by someone unique. There’s an incredible texture to these pieces. What kinds of processes and materials are involved? The materials I use for Candle Of Vision are all natural. Most pieces are a mixture of wool, alpaca and mohair. I also use off-cuts of leather sourced from furniture shops. 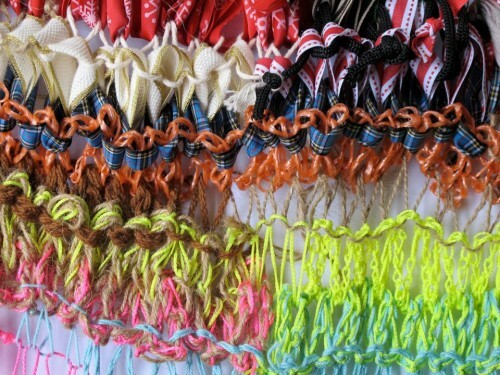 The current pieces involve knitting, weaving and braiding. They are all 100% handmade by me. How clearly are the pieces planned before you begin working on them? Not at all. Honestly, the first thing I do is choose a color palette, a pile of materials from my studio stores, then I just sit and start. I really enjoy letting things evolve organically. I guess the process actually begins with my incessant collecting and collating of materials. I do this continuously, subconsciously. I almost see it as the most integral part of each project. What kinds of ideas or reference points have emerged for you in making the pieces for this Project? At the moment, I am watching a lot of Mongolian film. I am obsessed! I adore the costumes and Yurts… and their gorgeous, giant red cheeks. If it was cold enough here, I would be making hats too. I will be experimenting with them once this body of work is complete, a version sans fur. I’ve been really absorbed with the Mongolian way of living and dressing. I have recently had two big exhibitions, one at C3 Convent Gallery in Melbourne and one (which continues until 22 April) at Penrith Regional Gallery. I have also been potting plants in discarded vessels, both natural and manmade. At the moment, I’m very focused on Candle of Vision, working to take it a little bit further. I enjoy working back and forth between this and the exhibitions, since they inform each other greatly. The Candle of Vision Project begins on Friday 13 April. Read more here. 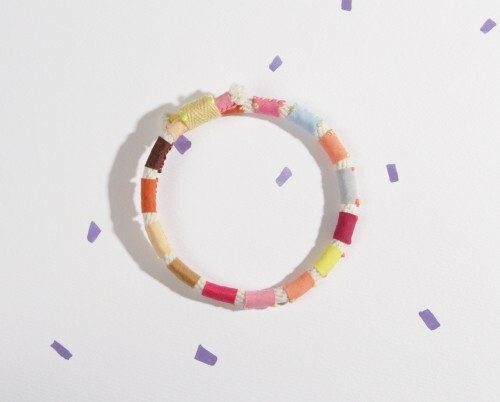 Erin Lightfoot is a Brisbane-based print and jewellery designer. Drawing on her background in both graphic and fashion design, Lightfoot blends bold, Art Deco-inspired patterns with soft fabrics and delicate porcelain. 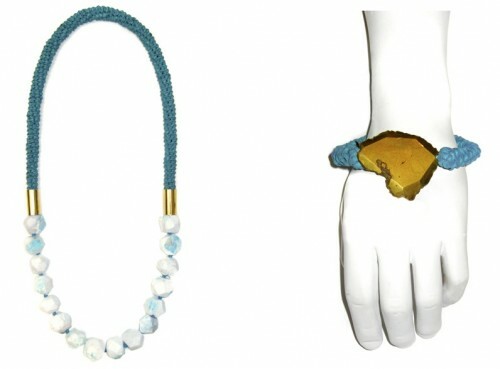 Projects at Poepke presents Erin Lightfoot’s second handcrafted jewellery collection. Extending her focus on graphics and pattern, this limited edition range bursts with energy and vivid colour. 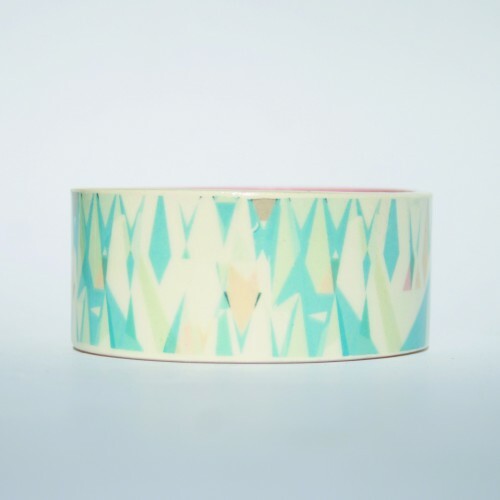 Zig zags, strong lines and asymmetrical patterns adorn porcelain bangles, hoop earrings and brooches. 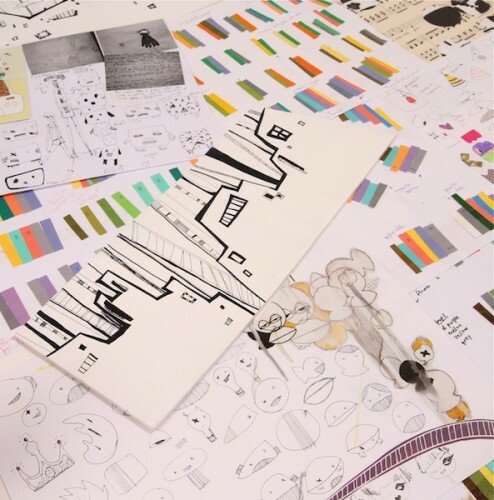 This Project also features a wider range of Lightfoot’s work, including her art prints. Erin, could you tell us about the pieces that will be a part of this Project? 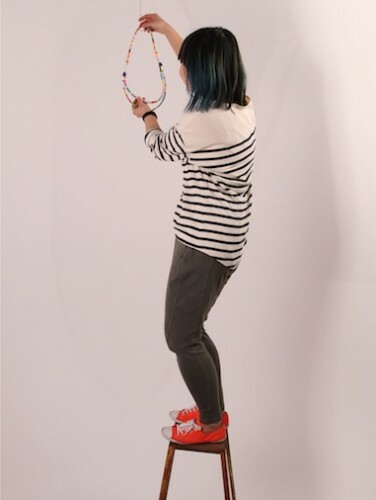 I’m making a collection of colourful porcelain bangles and hoop earrings. This collection includes woven designs and blocky patterns with triangles of burgundy, pale mint, pink, banana yellow and bright blue. I make everything by hand using porcelain and decorate each piece with a digital print of my artwork. Are there any particular styles, periods or ideas that inspire your work? I take ideas from all over the place and splice them together, so each print channels a mix of styles and periods. For example, one of the patterns in this collection is influenced by Tahitian textiles and Pac-Man graphics. I tend to make everything asymmetrical and like to have breathing pockets in each design. My work seems to have an Art Deco look to it. 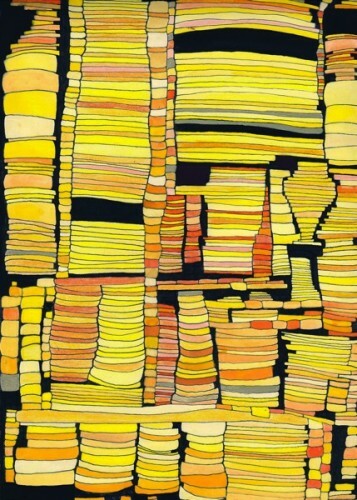 Main influences I suppose are artists like Paul Klee and Wassily Kandinsky. You started out as a graphic designer, now your work involves more tangible objects. How did this change come about? Yes, I started out studying graphic and web design – by far the best parts of which were the art electives. Making tangible objects resonated much more with me than building websites, so after a bit of mulling I changed over to a fine arts degree majoring in fashion. In my graduate year, I focused on print design and I’ve been building on this since. I really like using my hands and working practically, so now I just think of things I’d like to make and then see if I can. You design across quite a few different forms, including furniture, clothing and jewellery. What ties it all together? My print designs. I started drawing in a certain style quite a few years ago, then developed that look digitally and started designing prints for fabric. Since graduating, I’ve expanded on the uses for my print designs with upholstery projects and now my jewellery. I have lots of ideas for things I’d like to make but at the moment I’m concentrating on developing and expanding my jewellery range. I have ideas for wallpaper, and I’d like to try and make a light. If you can imagine something, there is probably a way to make it, you just have to figure it out. 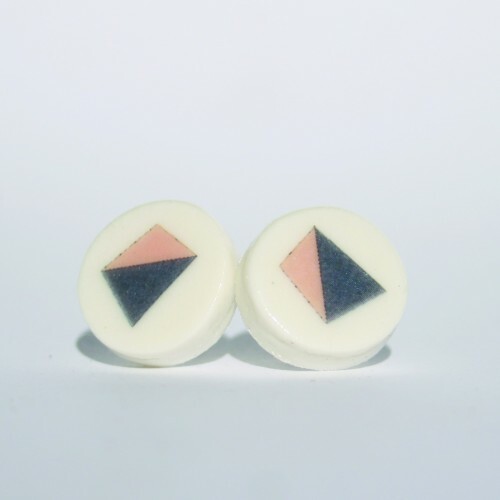 All of your porcelain jewellery is handcrafted, is that right? Is this quite an involved process? Yes it is and yes it is! There’s the print design aspect and then there’s the fabrication of the porcelain pieces. When I make something new, there is the initial challenge of figuring out how to actually make it but then a lot of the work comes down to the sanding, glazing and finishing of each piece. Each of my pieces is fired three times with various finishing and polishing processes at each step. I apply the digital print by hand which can be a bit tricky, so a lot of time and individual attention is applied to each piece. When you’re not creating, what can we find you doing? Thinking I should be doing more work! But, of course, I also do nice life things. Cook and have dinner parties, read, watch YouTube, go on the odd trip to the beach, drink wine, natter to my housemates, dance and think about future projects. 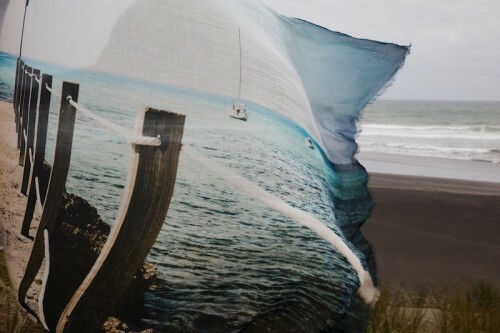 Erin Lightfoot’s project begins at Poepke on Friday 20 January. 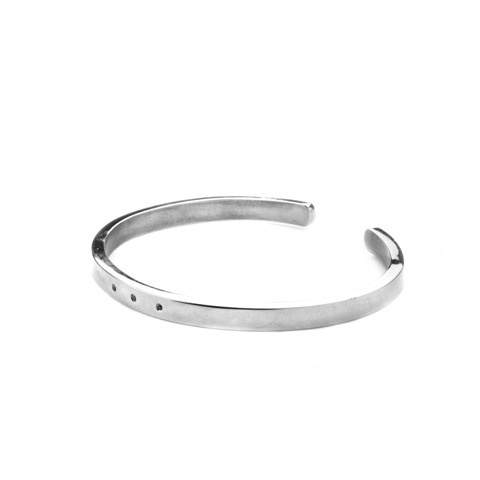 Our first collaborators are artists and jewellery-makers Lyn & Tony. 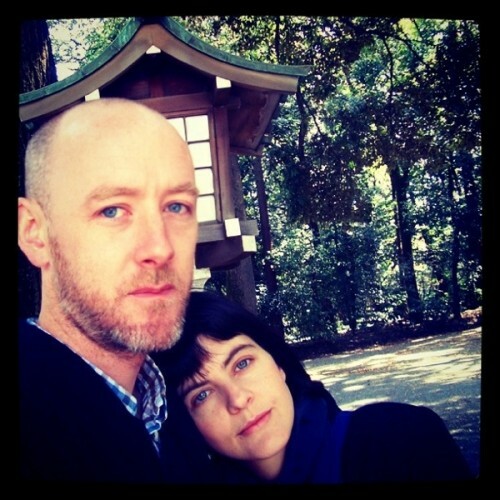 Long-term partners in crime, Lyn Balzer and Anthony Perkins have worked together for over fourteen years. Their work centres on human relationships with the natural environment: they are fascinated with the beauty and extremes of Australian landscape in contrast with the frailty of the human form. They are currently showing their photographic work in France’s Gallery Huit and, earlier this year, were selected as finalists for the prestigious Josephine Ulrick & Win Schubert Photography Award. 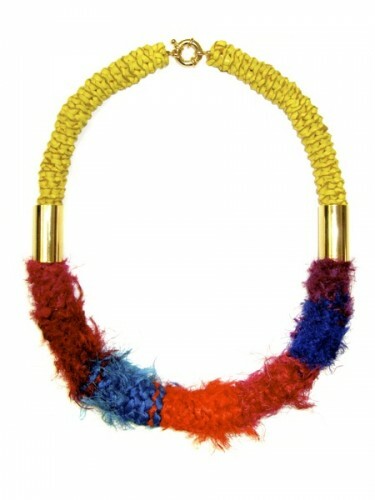 Their label, 2 by Lyn & Tony, utilises this aesthetic to create jewellery that is bold in colour and feel. As in their artwork, these pieces draw together different elements in tension: hand-crocheted kangaroo leather, semi-precious stones with complex textures, fine sterling silver and richly-coloured silks. 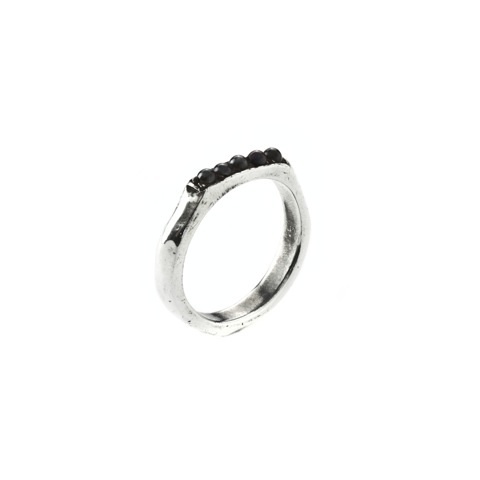 The entire range is handmade, resulting in intricate, detailed and unique pieces. The hours taken to create each piece are included on the label. This Project also features Lyn & Tony’s range for Gail Sorronda: entirely in black and white, this collection focuses on crocheted leather and faceted crystal. 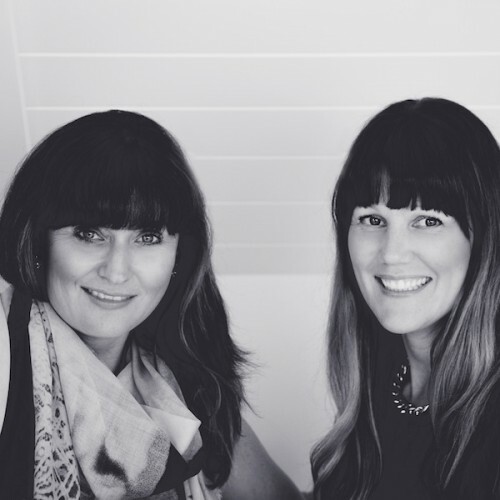 You’ve been artistic collaborators and partners for many years. How does your creative relationship operate? We share similar ideas but often approach things from opposite directions, somehow meeting at a common consensus. We like to surround ourselves with new concepts and opportunities so are always working on lots of projects at the same time, often working in collaboration with other artists. Nature is a large part of all your work. How do you feel about creating in Australia? Australia is our place of inspiration, where we create unique objects and send them out into the world. The inspiration for all our work comes from a similar place – the beauty of nature. We are particularly inspired by the unique textures and vibrant colours of the Australian landscape, and it was only when we began to travel internationally that we realized how important this influence was on our work. We have had a few significant events that reinforced this uniqueness: an important French photo curator who could not believe the incredible blue skies in our landscape photography had not been digitally enhanced, also an art director from New York who thought our landscapes were actually shot on a set that we had created, as they were so incredibly strange. How does this strange landscape infiltrate the 2 range? The importance of textures in our range is a direct influence of our landscape – the woven kangaroo leather that we regularly use in our pieces echoes the wonderful textures of banksias and other native plants. We also like to combine the leather with natural semi-precious gemstones often left in a relatively raw, unpolished state. The sensation of handling and wearing our pieces is equally as important as what the pieces look like. Vibrant colour is also significant in our collection, as the quality of the Australian light is uniquely pure and intense. The materials that you source for your jewellery are incredibly unique and beautiful. What has been one of your most interesting finds? The sourcing of our materials is very important to us, as we love to use Australian products wherever possible and, as we hand make all the pieces ourselves, the materials need to be enjoyable to work with. We have recently sourced a beautiful translucent polished agate, from a mine near Broken Hill, that has a pattern that looks incredibly like seaweed floating in the ocean. The 2 by Lyn & Tony Project begins at Poepke on Friday 12 August.